In late January 2011, just as discontent for Hosni Mubarak’s regime was reaching boiling point, the Egyptian government shut down Twitter and Facebook. By January 27, there were several reports that the Internet had been turned off. The next day the five major Egyptian telecom providers all went down within a 13-minute timespan. Amid a blackout, thousands of people poured into the streets and the government collapsed within two weeks. The phenomenon of social media as a tool for political uprising, especially in the turmoil of the Arab Spring, has been well established. Protesters created fake Twitter accounts and websites to evade government controls. Political demonstrators used Skype, Viber and Mumble to speak over the Internet. One activist even used Foursquare to transmit his location after he was detained by Egyptian authorities. What is less well known is how the increasing digital connectedness of African countries is creating unprecedented business opportunities. Africa’s digital economies still lag behind the rest of the planet. Out of 50 countries ranked for digital readiness by the Digital Evolution Index, three out of the four African countries measured – Egypt, Kenya and Nigeria – were dead last in respective order. South Africa was at number 33. But what African countries share in common is some of the world’s highest speeds of digital progress. In the last five years, Nigeria’s digital investments increased by 674 percent. South Africa has the world’s fourth fastest growing digital economy, demonstrating the tremendous e-commerce potential present in Africa. As the investigators of the Digital Evolution Index pointed out, African countries had a “rapidly increasing proportion” of people with Internet access, high cell phone penetration rates and a well-developed telecommunications network. 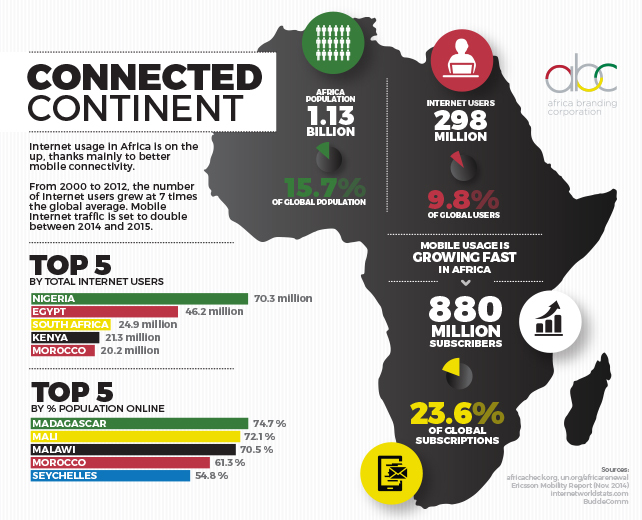 Indeed Africa is the world’s fastest growing mobile telecoms market, with 880 million users. The smartphone market is expected to double in the next four years. In this scenario, rising prosperity and affordability are driving mobile usage in a part of the world where a significant proportion of the population still do not have internet access, hindering growth opportunities. Capital expenditures to expand coverage and increase network capacity will total $97 billion over the next seven years. Telecom operators are harnessing the power of digital content to attract new business while others are making mobile market innovations that are being adopted in several countries. So far, African companies have been slow to exploit the opportunities presented by the mobile market, but they are catching on. Telecom operators are harnessing the power of digital content to attract new business while others are making mobile market innovations that are being adopted in several countries. In 2007, Kenya’s Safaricom, working with Vodafone, introduced the M-Pesa money transfer system that was initially designed for Kenyan women to quickly repay micro-loans. Now Kenyans use it to pay school tuition, taxes and traffic fines. Systems like M-Pesa enable the fast transfer of cash and today this amounts to big money (in 2013, customers made $22 billion in wireless transactions). The customer base of M-Pesa accounts for two-thirds of Kenya’s population and about a quarter of its gross national product. As crucial as supply and demand factors will be in improving the digital readiness of African economies, innovation could play the biggest role. What made M-Pesa so successful is that it created a cheap and fast way to move money for many people who do not have access to conventional banking services. Last year, Egypt took a leaf out of Kenya’s book and implemented the world’s first Arabic mobile money transfer system. That should provide a big boost for a country that has the potential to be among the world’s 10 fastest growing digital economies. But so far online business opportunities in Egypt have not materialized. Its e-commerce penetration rate is a lowly 3.4 percent. And while Egypt’s 12 million Facebook users are the most in Africa – as many as Nigeria and South Africa combined – social media is still a more potent political rather than economic instrument. If Egypt’s large online presence can translate into a large digital economy – that would be truly revolutionary.